Here it's possible to see the five SM58s feeding the PA set up in front of the soloists (front row of choir), plus the three condensers that were capturing their performance for the recording. To the left and the right are the BLUE Baby Bottles, with the SE1 in the centre. The story of a multi-miked location recording session, from pre-concert setup to the post-recording software-controlled mixdown. When recording an all-acoustic ensemble, the job is much easier if the instruments achieve a reasonable natural balance and if the room acoustics are sympathetic to the music. 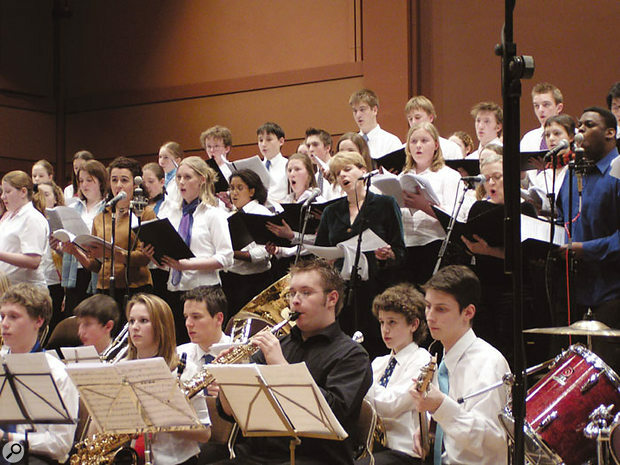 Assuming these criteria are met, ensembles of any size — from orchestras down to duos — can be recorded using a simple stereo mic technique, adjusting the mic-to-performer distance to obtain the correct balance of direct to reverberant sound. The job becomes more difficult, however, when you're recording a mixture of acoustic and amplified instruments, some of which are amplified separately via the house PA — which exactly describes a recording project SOS Technical Editor Hugh Robjohns and I undertook recently. The performance we had to record was of a modern choral composition entitled Rites of Passage, written and conducted by Richard Chew. It was around 35 minutes long and was to be performed by a large youth choir made up of choristers from six schools, plus five professional and semi-pro soloists supported by a small wind and brass orchestra, two electric pianos and a generous percussion section, including a drum kit. The performance venue was Malvern's Forum theatre, which (since its extensive redesign) has a remarkably dead acoustic, despite its cavernous size! Our job was to commit as faithful a representation of the performance as possible to 16 tracks of an Alesis HD24 recorder, using a selection of mics and direct injection. The HD24, as its name implies, does offer 24 tracks, but the mixer we were taking with us could only accommodate 16, so that's what we had to work with. Within this restriction, we needed to build in as much flexibility as possible, to allow us to create a good mix at the end of the project. The aim was to produce a CD for the composer, with tentative plans to also make it available to the schools whose pupils took part, any proceeds to go to charity. 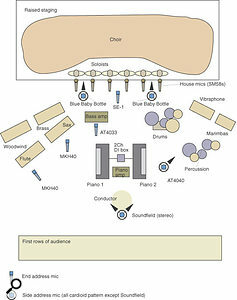 The layout of the performers and microphones for the Malvern Forum concert.The stage layout at the Forum was more conducive to live performance than to recording — and to make matters more difficult, we also had to move all the mics after the soundcheck, then reposition and check them during a 15-minute break in the programme. This was because the first half was taken up by several smaller musical items — something we weren't made aware of until immediately prior to the performance! Because the concert would be amplified through the house PA system, the balance we'd hear on stage would not be the correct front-of-house mix, so we couldn't just record the whole thing in stereo: multiple mics would be needed to achieve an acceptable balance. 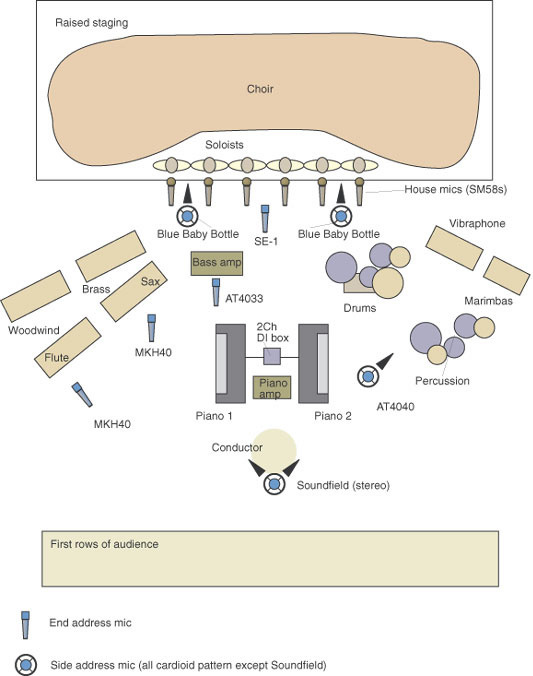 The original plan was to use a Soundfield mic above the conductor (see 'The Soundfield Microphone' box for more details), to provide the main stereo coverage, with additional mics to cover the left and right wings of the choir, plus three mics spaced in a row in front of the soloists (ie. one mic per pair of soloists). The two electronic pianos would be DI'd in mono and the electric bass guitar miked or DI'd as necessary. While Hugh and I rigged our equipment for the recording, the theatre's PA engineer set up five Shure SM58 mics in front of the six soloists, placed a mic on the bass guitar amp, and took DIs of the two electronic pianos in order to provide a little extra support via the house PA system. 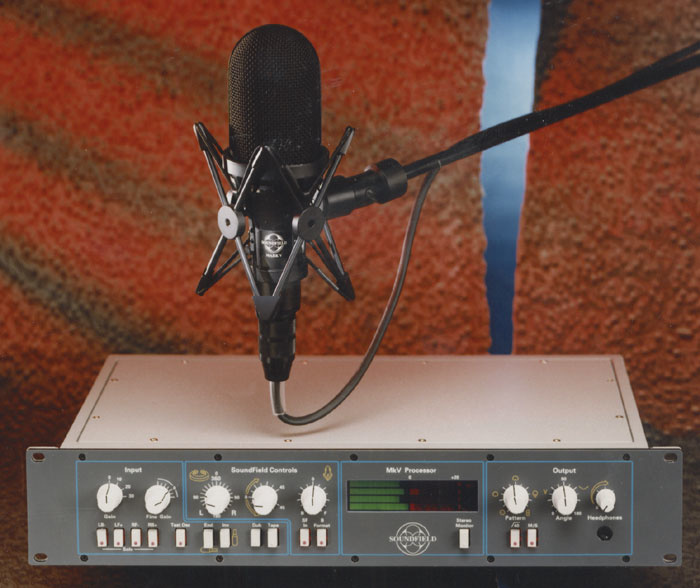 The top-of-the-range MkV Soundfield mic and processor.The Soundfield Microphone has been around for about 25 years, in various guises, and is arguably one of the most versatile microphones in the world. Sadly, it has struggled to gain widespread acceptance despite its remarkable qualities — but both Paul and I are sufficiently impressed with it that we each own SPS422-B Soundfield systems. This is the basic studio version of the three-model range (the others being the ST250 portable unit and the MkV flagship studio processor). The first Soundfield microphone was developed by the National Research Development Corporation (NRDC) and Calrec Audio, based on the work of mathematician Michael Gerzon. It formed the heart of what became known as Ambisonics — an advanced surround sound system which suffered (unfairly) through association with the much inferior quadraphonic systems of the late 1970s, and is only realising its true potential now with the increasing use of DSP-based decoders. In 1993 the rights to the Soundfield microphone technology and patents were bought by Soundfield Research, which has been marketing and developing the microphone and its associated systems ever since. For anyone not familiar with the technology, the Soundfield microphone comprises four sub-cardioid capsules in a tetrahedral array (see photo, right). 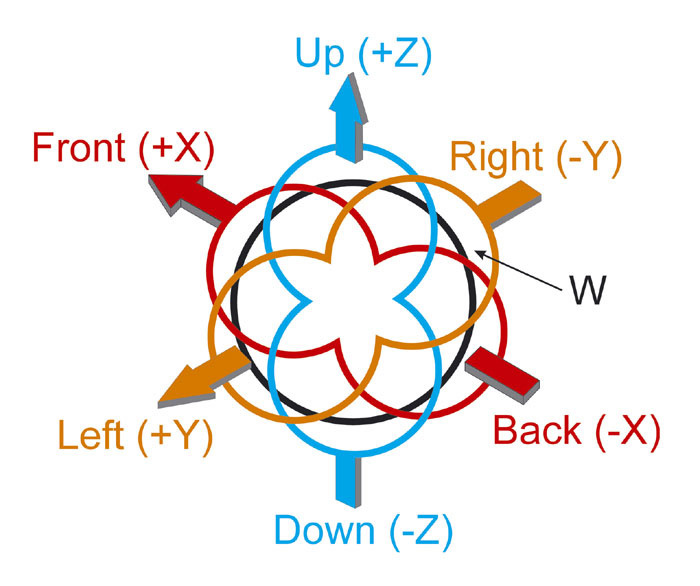 The outputs from these elements are 'transformed' in the associated control unit to provide signals equivalent to those generated by four first-order virtual microphones, all four being 'coincident' with one another. This combination is known generically as the 'B-format'. 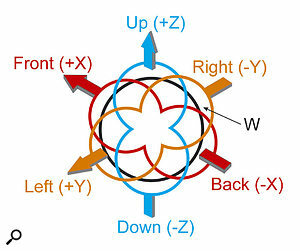 The four signals equate to an omnidirectional microphone (known as the 'W' signal), and three orthogonal figure-of eight microphones facing front-back (X), left-right (Y) and up-down (Z), respectively. You could think of it as a kind of three-dimensional MS (Middle & Side) array. The strength of this composite B-format signal is that it contains all of the directional information of any incident sound wave in all three dimensions, and can either be recorded to a four-track machine, or processed directly to produce any number of outputs, corresponding to virtual microphones pointing in any direction and with virtually any polar response. All three Soundfield mic processors can provide the raw B-format signal for recording purposes, but only the MkV and SP451 processors have the facilities to manipulate the signal in that domain as well (although Soundfield have produced a very clever plug-in for the SADiE and Nuendo DAWs (Digital Audio Workstations) that provides sophisticated manipulation and surround-sound decoding functions). Although the Soundfield mic is ideally suited for surround-sound acquisition, most people use it as an ultra-flexible stereo microphone or even as a high-quality mono mic (Pete Waterman is said to favour the Soundfield mic for recording pop vocals). All three Soundfield controllers provide a stereo output and the signal can be manipulated and configured in the MS domain, with controls to adjust the notional 'M' mic's polar pattern and the relative level of the virtual 'S' mic. The internal MS signal can then be transcoded to conventional left-right stereo for recording. In effect, the 'Pattern' control determines the amount of ambience and the 'Width' control sets the size of the stereo image — both adjustable in real time, remotely, and without having to fiddle with the microphone itself. Soundfield B-Format signals.We chose to use the Soundfield mic for the Malvern Forum project partly for convenience, but also because of an interest in acquiring surround sound material for future experimentation. 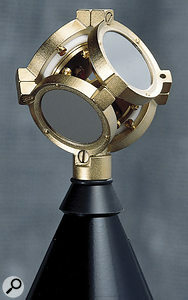 The Soundfield microphone is compact and easy to rig — like any single-bodied stereo mic — but it has the advantage that once it's suspended in roughly the right place above the orchestra, the direct/ambient sound balance and stereo width can be adjusted from the control unit, saving the user from having to physically mess around with the microphone too much. During the rehearsal, it became clear that the orchestra was rather smaller (and quieter) than we had anticipated and the choir rather larger (and louder! ), so the plan quickly had to be amended. We also realised that some of the youth choir were sitting along the front of the rostra where our three soloist mics were placed, and there was therefore a danger that we might pick up a lot of mechanical thumps and bumps from the children hitting the stands. In addition, it became apparent that some of the soloists tended to move around and often favoured the SM58s directly in front of them. The quickest and easiest way to address these issues was to relocate the two mics originally intended to cover the choir sides, to help capture the woodwind and brass, respectively. We also added an extra mic to provide a little more definition to the percussion ensemble, and put a further mic in front of the small bass amp, rather than using a DI. As a final safety fall-back we thought it prudent to arrange a mixed feed of the five SM58 mics from the house PA. I also lowered the Soundfield mic to about eight feet high (I had initially set it up at about ten feet), in order to give a little more prominence to the orchestra. As the drum kit was being used in more of an orchestral context, close miking of that was not thought necessary. All but one of the soloist and orchestra mics was connected to a 25-metre, eight-way multicore back to the desk, and there was a separate dedicated cable for the Soundfield mic. An Alesis 3204 mixer was used to accommodate the microphones, as it has quiet mic amps and also features direct outputs on all 16 channels. Furthermore, it has an in-line monitoring system, so we were able to listen to a mix of the recorder outputs and also solo individual microphones without disturbing the recorder feed. This whole rig was located in an aisle at the side of the choir rostra. This meant that loudspeaker monitoring was out of the question, so we monitored via headphones. 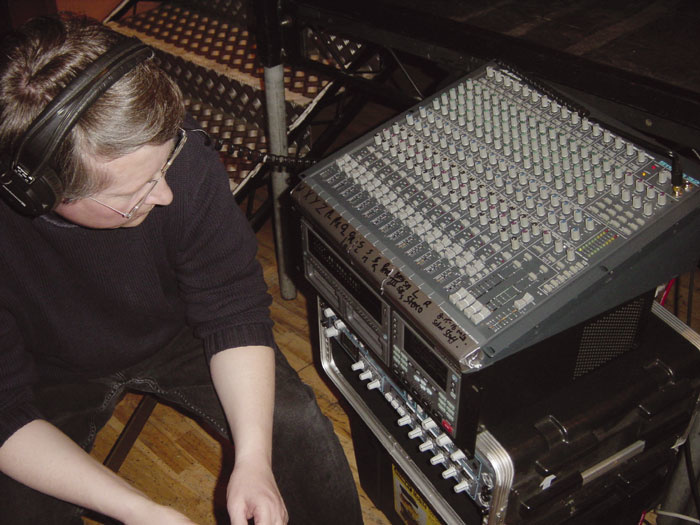 To avoid low-frequency thumping caused by stage noise, we used the low-cut switches on the mixer for the soloist mics, and also asked the conductor to get the choir members to remove their shoes during the performance, which they did. This simple measure was well worth taking, as it dramatically reduced the amount of stage noise. The Soundfield mic, positioned high above the conductor, was intended to provide the main stereo coverage of the choir and orchestra. Two spot mics (Sennheiser MKH40s) were also used on the choir. The final configuration of sound sources occupied 16 tracks of the Alesis HD24 hard-disk recorder, recording at 24-bit, 44.1kHz. The first four tracks carried the B-format outputs from the Soundfield mic, as Hugh thought that we might be able to experiment with some surround-sound remixing of the concert at a later date. Next came the two piano DIs, the woodwind and brass mics, and the three soloist mics. The bass guitar and percussion mics were next, followed by a mixed feed from the house PA's array of SM58s and, finally, the stereo output from the Soundfield mic. Pianos were DI'd using a dual-channel passive EMO box, and a third single-channel DI box was used to isolate an auxiliary output from the house PA's desk (a Soundcraft 6000) of the five soloist SM58s. The two orchestral mics were Sennheiser MKH40s on high stands, with Audio Technica mics for the bass guitar amp (an AT4040) and the percussion (an AT4033a). Originally the soloists were covered by three BLUE Baby Bottle mics, but one developed a fault and had to be replaced with an SE1 at the last minute. The mics used were, inevitably, condensers, chosen for their full frequency range and high sensitivity, with the exception of the SM58 dynamics placed by the house engineer. The mics' cardioid (directional) pickup characteristic helped us to exclude spill from neighbouring sound sources and gain some separation, as a cardioid pattern picks up sound most efficiently from one direction and tends to reject off-axis signals. Hugh Robjohns with the Alesis 3204 mixer used during the recording.The orchestra mics were moved to achieve a reasonable balance between the orchestra and choir during the soundcheck, and because of the close proximity of the soloists to the centre of the choir, we judged that the solo mics would also reinforce the choir, to the extent that additional choir mics would not be needed. Recording levels were set up during the soundcheck to leave between 6dB and 12dB of headroom, which was established by using the indefinite peak-hold feature on the Alesis HD24. During the rehearsals we were able to confirm that the mics were all providing the coverage we expected of them, with reasonable separation, and that everything was hum and buzz free. The simple setup outlined above worked reasonably well, but it did throw up a few interesting points that are applicable to most jobs of this kind. The first is that as we had to remove the mics before the show and then reposition them in the interval, there was no guarantee that their positions would be exactly the same as during the soundcheck. We marked the positions of the mic stand bases on the floor with crosses of gaffer tape, but that's about as precise as we could be. Perhaps the biggest challenge was capturing the solo vocalists adequately, as they tended to move around, and in some sections some were noticeably louder than others. As we were covering all five of them using just three mics, we had a degree of control at the mixing stage, but not always as much as we'd have liked. The other balance issue was to do with the relative level of the choir. We'd set up the mics during the afternoon rehearsal and soundcheck to achieve what we felt was a natural balance between the choir and orchestra, but we had very little further control over the choir/orchestra balance at the mixing stage, though we did have the option to automate the levels on the soloists' mics when the soloists weren't singing, to bring up the choir. Inevitably, some of the amplified electric pianos and bass guitar bled through to the orchestra mics and to the stereo Soundfield mic, but fortunately it wasn't so loud that it caused us any major balance problems. One of the pianos was switched to an organ sound for about the last third of the performance, and this had to be increased in level, using mix automation, in order to achieve a correct balance. Another balance-related challenge involved the drums and percussion, which fed through into all the mics to such an extent that the separate percussion mic wasn't really needed. With hindsight, that mic would probably have been better utilised for miking the choir. As it turned out, we ended up with an acceptable balance, but had it not worked out that way, there was very little more we could have done about it. Just as with rock bands, everyone seems to play with more exuberance (read level!) during the performance than during the rehearsal. To mix this project, I transferred it from the HD24 ADAT recorder to my studio-based Mac system, using the Alesis Fireport adaptor, which allows the ADAT's system drive to be read by the computer as an external Firewire drive. Its support software includes a utility for selecting which tracks to copy over, and in what audio file format. This is straightfoward, and I'd estimate that moving the whole 16-track project to my Mac's hard drive took less than 10 minutes. The reason for mixing in the Mac was so that my Logic Audio sequencing software could be used to automate mix levels — and so that we could use plug-in processors, specifically compression and EQ. The first step after importing the audio was to audition the individual tracks, to see if there were any problems. 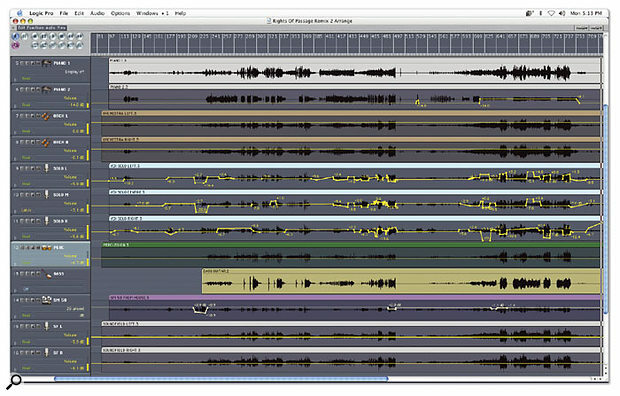 The solo vocalist group would obviously require some juggling via the track automation, to keep the overall level even, and one of the sopranos had a particularly piercing voice that had to be tamed slightly, using a notch filter at around 1.8kHz. The low-cut shelving filter was also used, adjusted to remove as much low-end spill as possible without materially affecting the tone of the voices. We created a separate subgroup of the three vocal spot mics plus the feed from the house PA, and inserted a compressor into this group just to tame any vocal excesses. We set the compressor to give around 6dB of gain reduction on the peaks, which had the additional benefit of lifting the choir level slightly when the soloists weren't singing. The basis of the mix was to be the Soundfield mic's stereo output, naturally, but surprisingly the balance between choir and orchestra favoured the orchestra a little more than was ideal, due to their previously mentioned exuberance! This was confirmed by the peak-reading meters, which showed that our headroom was down to 3dB in some cases, where it had been in excess of 12dB during the rehearsal! With hindsight, Hugh suspected that he might have set the height of the Soundfield mic a little too low when we adjusted the rig during the rehearsal, but it's very hard to make this kind of critical judgement when monitoring on headphones in the same space as the performers! The three orchestral spot mics (wind, brass and percussion) were panned to match the Soundfield's stereo image and balanced to provide a degree of clarity and focus for the mix. We compressed and equalised the bass guitar signal — to produce a consistent sound that underpinned the mix but was still audible in its own right — and panned the two pianos slightly. Otherwise, the pianos were more or less left alone, although the level of one of them had to be increased when it switched to a church organ sound, as mentioned earlier. The three soloist mics were also panned only slightly across the centre of the stereo image, to minimise unwanted image shifting when we automated the levels of those mics. Our three-mic configuration actually delivered a pretty respectable sound that also helped to complement the level and definition of the youth choir quite well. The mixed feed of SM58s helped to bolster the soloists a little when they occasionally wandered off-mic, but as this feed was a mono source it compromised the stereo imaging if used too high in the mix, so we added it sparingly. Logic Audio's automation was used extensively during mixdown, to maintain a correct balance between elements. Getting a reasonable ball-park balance of all the elements of the ensemble turned out to be fairly straightforward, but because the soloists had been close miked they sounded rather dry. To help everything 'gel', as well as to compensate for the unusually dry hall acoustic, we added a couple of different convolution reverbs, rather than using conventional artificial reverb. 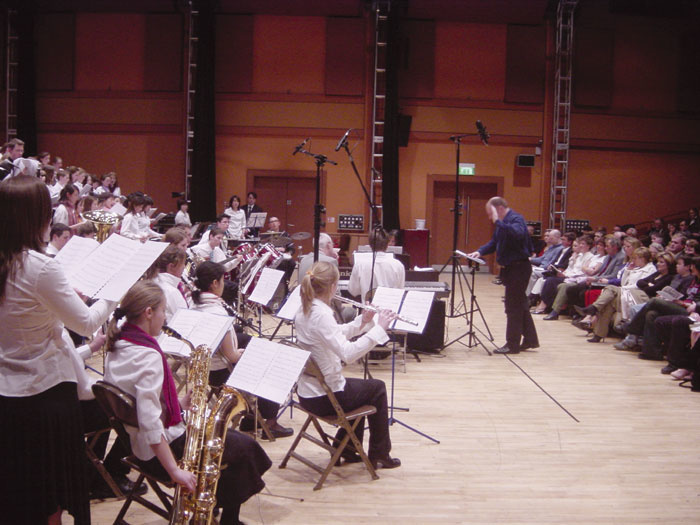 Convolution reverbs are based on the sound of real rooms, and when you have genuine room acoustics present already to a certain extent, as we did at the Malvern Forum, it sounds more natural to add the sound of another real room than an artificial ambience. In the end we used one convolution reverb plug-in (Emagic's Space Designer) on the channel sends, to impose the acoustics of a real concert hall on the recording, and the Waves IR1 (in the vocal mic subgroup insert) to add a slightly more rounded concert-hall reverb to the vocal soloists. The miked orchestra already included some natural room ambience, so we were careful not to muddy the sound by adding too much reverb. The addition of appropriate concert hall reverb made a huge difference to the subjective quality of the recording and also knitted the sounds together in a very natural way. When it was time to fine-tune the mix, most of the work went into automating the levels of the three soloist mics to achieve a consistent vocal balance. In sections where none of the soloists were singing, we could increase the mic level subtly when required, to boost the level of the junior choir behind them. We then sent a preliminary CD mix to the composer, and he made a note of any further adjustments he deemed necessary, prior to attending the final mix session. The finished mix was topped and tailed and burnt to a master CD using Roxio's Jam. With hindsight, I would have liked a couple more mics on the choir, but because we mixed in software we were able to easily and extensively automate levels, allowing us to compensate to a large extent for not having quite as many mics as we would have liked. The end result sounded very natural and met with the approval of everyone involved.